I had in my mind an amazing patisserie bake for Valentine’s Day, I bought all of the ingredients and prepared my templates, I’d even watched some YouTube videos in preparation for the chocolate work I was going to do. Sadly time was not on my side this week and I just felt too tired to take on such a labour intensive bake. Also, on a side note the Spanish strawberries I’d received from Ocado were huge and they wouldn’t really have worked for the purpose I wanted them. So I’m going to wait until English strawberries are in season and I can get some delicious sweet dainty strawberries. What to do with limited time, a punnet of strawberries and two pots of whipping cream? I thought about making meringues for Eton Mess, I always have egg whites in the freezer, I put them in ziplock bags with the date of freezing written on them. When I need to use them, I place the bag in a bowl and allow them to thaw at room temperature. Old egg whites make brilliant meringues and macarons, so remember don’t throw away those egg whites! Then I remembered I had a batch of cooked choux buns that I had frozen in ziplock bags, left over from the Paris-Brest I made. I wanted to know how well choux froze and this seemed like the perfect time to find out. 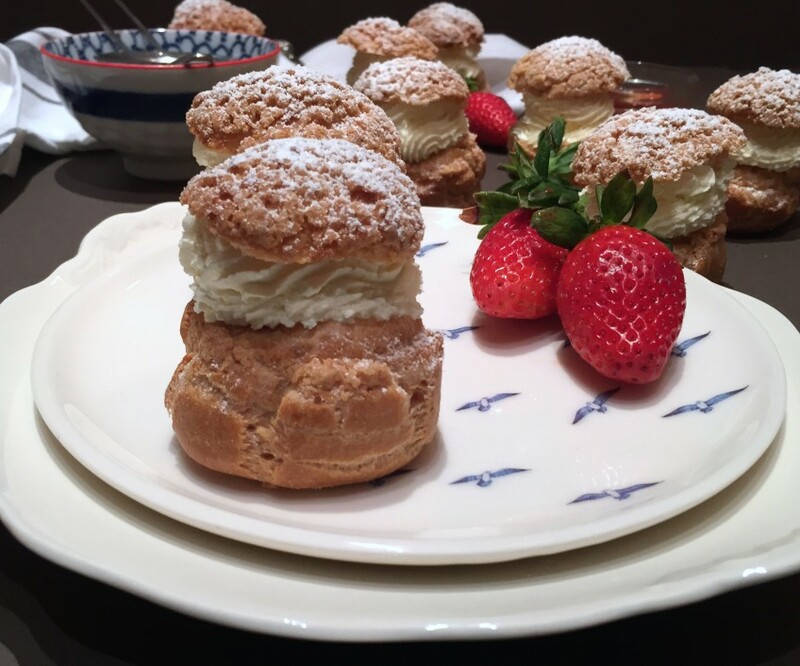 I’ve learnt that some things don’t freeze so well, milk for example is fine, cream not so much, choux however is pretty resilient. The frozen choux still had quite a lot of structure, it’s not as crunchy as choux that hasn’t been frozen, but they still tasted wonderful. 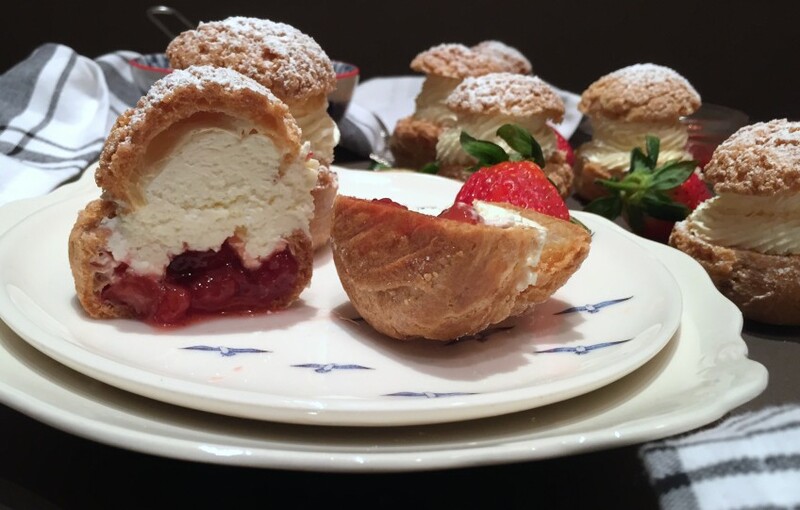 I haven’t tried to freeze choux pastry that hasn’t been cooked, but this resource from Delia Smith has tons of information about what can and cannot be frozen. I didn’t cook the thawed choux buns in the oven for a few minutes as described in the article (I didn’t know you needed to), but they tasted fine to me, perhaps this would give them some of their crunch back. 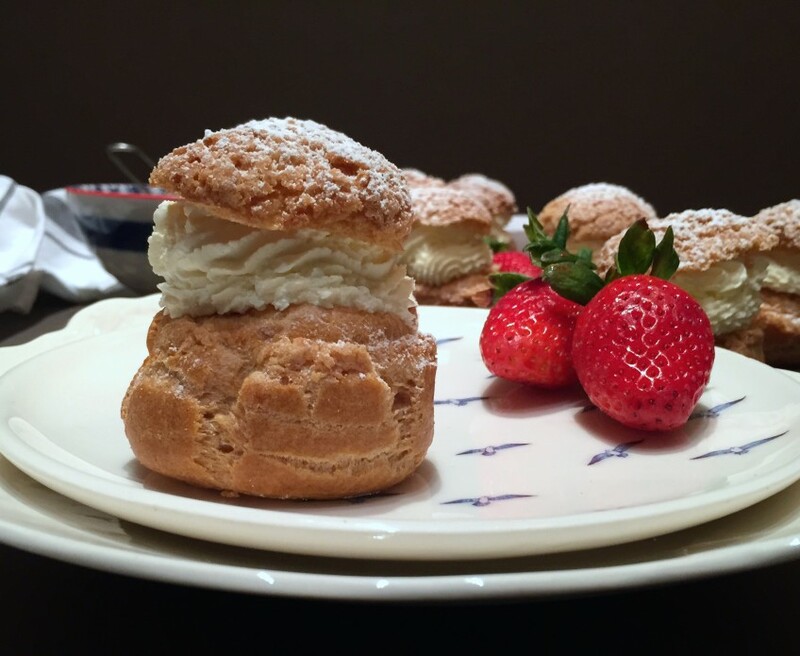 The choux buns are filled with a strawberry compote that is so easy to make. This is where I get a bit smug, I dug out a jar of the strawberry jam I made last summer with the glut of strawberries I had in my garden. Now don’t start getting any ideas that I’m a keen gardener, I’m on my third rosemary plant – the damn things don’t seem to grow, I’ve also killed a mint plant, pulled up my own spring onions too early, that I planted because I thought the seedlings were weeds and sowed my beetroot so close together they were the size of radishes. Yet for some reason the strawberries just seem to get on with growing and I stay well away, just offering water and picking off the odd slug/grub/snail/slimy thing. If you don’t have any home made strawberry jam, shop bought is fine, there’s no judgement here. The jam is heated with a little water and mixed with chopped strawberries and then left to cool, the last step is to whip the cream until it’s stiff. The choux buns can then be filled, cut the choux buns just beneath the streusel topping and fill the bottom halves with the compote, then pipe swirls of whipped cream onto the compote and top with the streusel top and dust with icing sugar. A more detailed recipe is below. These are delicious choux buns with a streusel topping, filled with strawberry compote and whipped cream. These can be made in advance as the cooked choux freezes really well and can be thawed at a later date. Begin by making the compote, add the strawberry jam and tablespoon of water to a small saucepan. Heat the jam until it forms a syrup and then add the chopped strawberries. Cook the compote for a couple of minutes allowing it to bubble, then leave it to cool. To make the streusel combine the flour, sugar and fleur de sel in the bowl of a food mixer. Knead with the paddle attachment then add the softened butter. When chilled use a pastry cutter to cut out 10 rounds of pastry 3cm in diameter, return to the fridge. To make the choux pastry, preheat the oven to 180C (160C Fan) Gas 4 and line two baking trays with baking parchment. With the pan still on the heat, stir vigorously for 2 minutes, then tip the dough into a bowl and beat for a few minutes until it stops steaming. These two actions help to cook the flour and dry out the dough, which in turn helps it to absorb more egg. This helps the choux pastry to expand properly as it bakes. Pipe balls of choux onto the prepared baking sheets, ensure they are well spaced and around 3cm in size. You may find that you have more than 10 choux buns, but just keep piping them - don't pipe on top of the existing buns as the shape will distort. If you have extra choux buns they freeze well once cooked. Top each choux bun with a streusel round and bake for 25-30 minutes until golden brown and crisp. Turn off the oven and leave in the oven to cool for 30 minutes before filling and decorating. When the choux has cooled down, gently slice the tops off the choux buns, just below the disc of streusel pastry. Whip the cream until stiff and spoon it into a piping bag fitted with a star shaped nozzle. Spoon the cooled compote into the bottom half of the choux buns and then pipe a double layer of cream on top of the compote and bottom half of choux, ensuring no compote can be seen. Top with the streusel top and dust with icing sugar. The filled choux buns will start to soften, so these are best eaten within 24-48 hours of filling. The frozen cooked choux pastry will keep for around 2 months, just thaw at room temperature before filling. Do you have any baking short cuts? Tips or hints that save you time in the kitchen, but still yield great results? Let me know in the comments. I’ve added this to treat petite with Kat at The Baking Explorer, who is hosting this month and Cakeyboi. Wow these are stunning! Thank you for entering into Treat Petite. Thanks Kat, I managed to understand the ‘petite’ part this time! Cheers for commenting. These are gorgeous, thanks for joining in with #thepastrychallenge 🙂 love all that cream filling the buns, yum! Thank you for including my recipe. These taste amazing and you’re right about all the cream! Delicious. I’m definitely going to have a look at the Delia site you recommended as I never have a clue what you can keep, how, or how long for. That site is amazing Charlotte, so useful. Thanks for commenting, these are delicious. Thanks Jodie – yes they were massive strawberries, they didn’t have a huge amount of taste until I mixed them with the strawberry jam. The strawberry compote adds such a nice sweetness. I didn’t sweeten the cream, so they compliment each other really well. They did rise nicely didn’t they 🙂 Thanks for commenting Jelena. The link in the post for the Delia Smith website has details for nearly everything you’d ever want to freeze. It’s amazing. Thanks so much for the kind comments, feel like I’m really getting somewhere with choux pastry now. 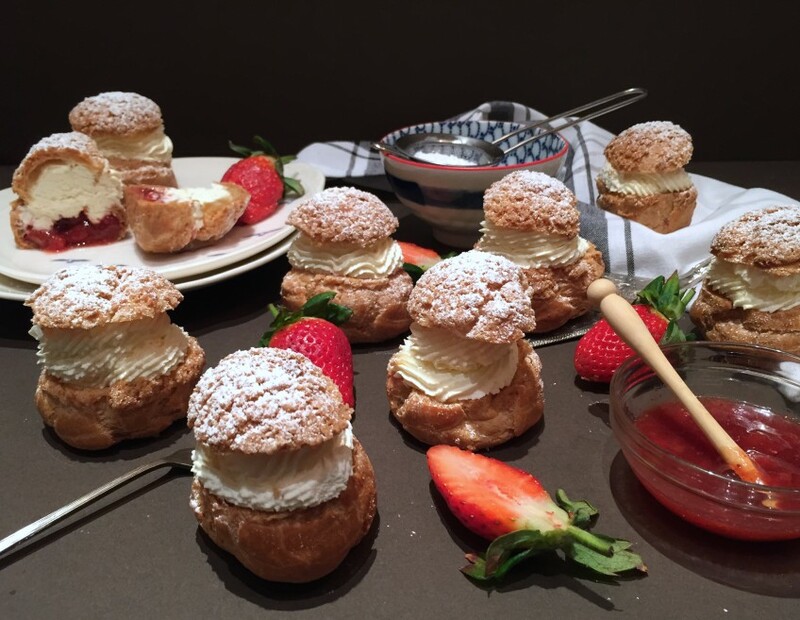 Great pictures, I’m pretty new to choux, so I love seeing your posts involving them. Thanks Emma – all shot on my iPhone 6 🙂 I don’t have a very good camera and the one on my phone is actually better. 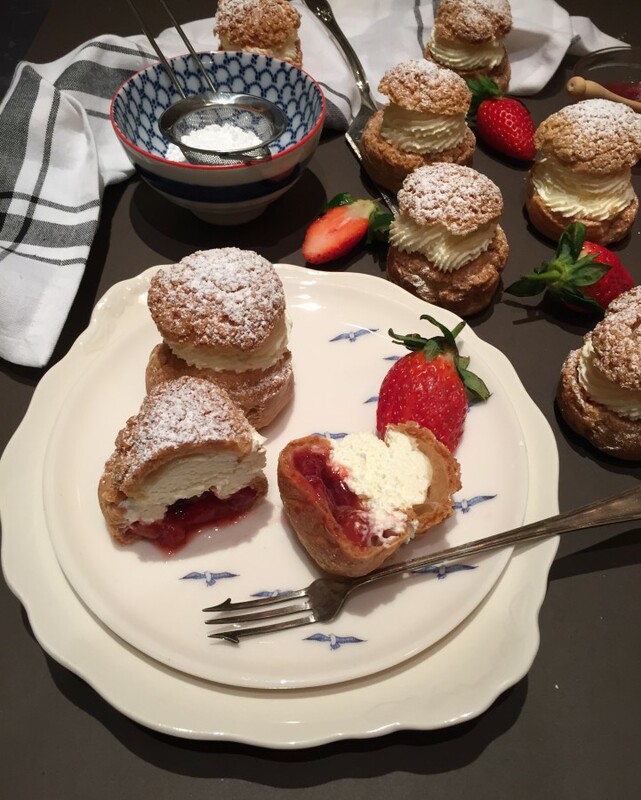 I have had lots of failed attempts with choux, this post describes one such failure https://www.patisseriemakesperfect.co.uk/tarte-chouquettes-choux-puff-tartlets/ it just takes practice, I promise.